Oh my goodness, what a fabulous weekend! I hope as I write this there are not too many competitors applying after-sun as they sit at work in a complete daze. It was as hot as the hinges of a deckchair on a Copacabana beach. 210 boats in 8 fleets arrived at Hayling Island SC for their RS Sailing Summer Championships in hot, hot sun. Saturday was a gentle F2-3, and all fleets got their 3 designated races in with only a short postponment. Back to shore early evening, all competitors were greeted by Alex Newton-Southon, MD RS Sailing, and Clare and Sally, Association Secretaries, giving out hard-earned and very welcome beers. Then watching the spectacular sunset from the HISC balcony, enjoying the curry and dancing to 'Still Moving'. Sunday was a much lighter affair with no sea breeze appearing. The RS200/400/700/800 course managed 3 races in extremely light winds, and the RS100/300/500/Aero course, suffering from even lighter conditions managed one race. Many thanks to Hayling Island SC for their slick race manamgement, great grub, large balconies and enough room to have all of us there. Many thanks to RS Sailing for sponsoring the event, providing Saturday night's entertainment and come-ashore drink. Many thanks to Harken UK for providing some lovely prizes. And many thanks to Clare and Sally for keeping it all together on shore. An excellent turnout of 24 RS100s pre-entered for the RS Southerns at HISC on 17/18 June, hoping for waves, wind and perhaps even some sun. For once, the forecasters got it right, wall to wall sun it certainly was; from our Bracklesham Bay vantage point you could see a packed West Wittering beach grow pinker as the days progressed. With a sub 10 knot breeze, it was going to be interesting who would come to the fore. 2015 Nat Champ Brett Aarons had a new boat, as did Multiple 10.2 Champ Huw Powell. Is he slimming down for this 8.4 malarky? 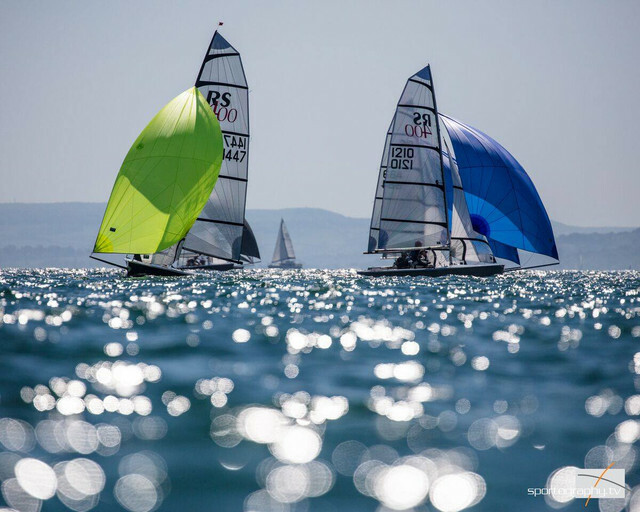 Conditions looked ideal for the winner of the past two events, Ian Gregory, but after a week at the Laser (excuse the profanity) Radial European Masters would he have forgotten what to do with 3 times as much sail area? Two of the Chew crew were in the boat park, but would they again just have a round of crazy-golf then sneak off home just as the rest of us go sailing. Nope, not so much any of them. As it happened, the star of the show on Saturday was just-finished-my-GCSEs Robert Richardson with a 3-1-3, leading the 1-2-8 of last year's Nat Champ Al Dickson. Behind, it was tight all the way down, with a single point or count-back being the difference between placings, but those two would need to keep a particular eye on Nils Jolliffe, holding a 2-UFD-3. Sunday's denouement was lighter and even hotter. After a slow sail out to a committee boat seemingly hull-down on the horizon (equator-crossing tributes to Neptune were hastily being improvised) and a delay for the wind to settle, it was Al who led from the off, chased by Mark Harrison, Clive Eplett and Robert. Second time around, Al decided to round the right leeward gate buoy as if the left-hand one. By the time he'd unwound himself, it was game-over. Meantime, Andy Jones (making your correspondent wish he, Andy, did stick to golf) pressed the turbo button and shot past first Robert, then Clive and Mark, boat-speeding into an unassailable lead. Perhaps regretting his choc-bar predilection, Mark slipped behind those two on the last run, which would cost him overall. What wind there was then gave up the ghost. The OOD ran another start but we were barely beating the tide so, rightly, three guns were fired, to general acclaim. The 100s next assemble only a few miles over the Severn Bridge in Llandegfedd on1-2 July. Last year's event was a corker, with a warm welcome from the keen and capable home fleet and some great racing. Plus entries are already building for the National Champsionship at Weston. Don't miss out, 100 sailors. And so to Hayling Island Sailing Club for the 2017 RS Summer games. The island is a funny old place, with its rusty funfairs, chippies, estate agents' boards offering a free pizza with purchase, cars with second hand value of a corn plaster. Then there is the bit by the coastline, where the real estate is impressive but odd - everyone has their front room on the first floor for the sea view. The splendid HISC itself, as you probably know, is quarantined in splendid isolation at the end of Sandy Point, an anagram of which I note is 'dystopian'. Anyway, the sailing. Saturday there was a sort of sea breeze (f2 … Ish) to take the edge of the heat. RO sensibly flew a U flag, meaning he could penalise the premature without throwing a spanner in the 4 fleet start works. Wind (I think) was generally moving a wee bit left, but with nearly fifty 200s, getting the front row was the priority - I let myself get buried, duh. Downwind was tricky for crews, with the waves and tide causing collapses in spinnaker and helm patience. (Not my crew, of course, who handled the sheets as gently as she might an octogenarian lover. With cardiomyopathy). Sunday the wind was lighter, but our estimable race officer got us off the line for all three races. Personally, I had a few purple patches, which you need to stay in contention - and had set the rig up for 'asthmatic-wheezing-through-a-straw' breeze. What I failed to avoid were a couple of brown patches, one of which involved getting stuck under the windward mark with Chris Catt, whilst half the fleet sailed over the top of us on the starboard lay line. Anyway, results below - Matt and Emma from George and Sophie. Etc. Fabulous weather, and excellent RO-ing was much appreciated by all. We also trust Andy Peters recovers soon from his olfactory infection, diagnosed by his shipmate as 'snyphillis'. 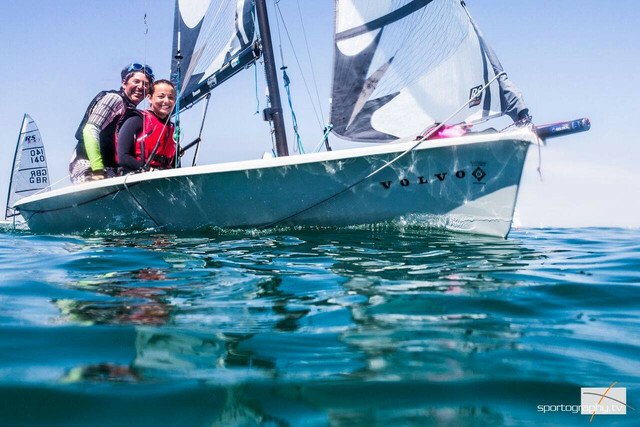 RS Sailing RS300 Summer Championship was held at Hayling Island SC. It was great racing on Saturday with just enough wind to hike in blazing sunshine. The racing was made all the more tricky by having lots of RS Aeros starting five minutes before us creating wind shadows and fun at the marks. First race saw Harry McVicar and most of the fleet hit the right hand side with Dave Acres going up the middle. The right paid and Harry rounded first with Acres second and as much as he tried he could not get past the lighter youth who covered well and made no mistakes. (Whatever happened to age before beauty?) Paul Watson came in third after sailing a little further after going round the spreader mark meant for the RS100s who were doing upwind, downwind legs rather than the trapezoid course set for us. Race two saw what appeared to be another clean start with most going right again. Acres led but McViicar again showed good pace and the positions changed a few times with Acres just managing to come back through at the end. Sadly for Harry he was UFD'd for being over the line with one minute to go. Rather than a black flag, the U flag (red and white squares) was used, which seemed a little vicious for a friendly little fleet like ours. Ben Deacon took advantage and picked up second with Rob Jones in third. The third race saw Nick Bubb take a port hand flyer and cross all but Rob Jones who started at the committee boat. This at least proved that the line was square but also that the rest of us in the middle were late. Again it turned out to be Acres and McVicar fighting it out. On the last run it was Harry who just led but Acres harassed him the whole way down and managed an overlap by a gnat's foreskin before the gybe mark helped by two RS Aeros. Watson took a closely fought third with Jones fourth. A delicious cold beer was provided by RS for tallying off, which was very welcome and got us all into the drinking mood for the ensuing evening. This was topped off with a curry thrown in for good measure along with a band and a spattering of RS200 totty thrown in for entertainment. Sunday brought baking conditions. Mark Taylor, all the way from Scotland was very pleased to see sun for the second time this year but less pleased at the lack of breeze. After a long drift out to the start the Race Officer kept us all sitting around. This was all the more frustrating when we could see the RS400s, RS700s, RS800s and RS200s racing away on a different course in the distance. Four of us gave up the wait and drifted in only to hear the starting hooter go in the distance and race four begin. Harry showed a clean pair of heels with Paul second and Rob third. Race five was canned part way through due to a lack of breeze. Well done to Harry for sticking it out and getting a well-deserved win, along with some stripy burnt arms. Having grown up 10 miles from HISC and been to more Fed weeks thank I can remember, in my head an event at Hayling is always hot and sunny with light to moderate winds. This was certainly the case for the RS summer champs, where over 200 boats competed across 8 classes. The 400 was the place to be for this weekend. Enough power to get going in the light breeze while much more comfortable than the fast planning trapeze boats in the lighter stuff. The perfect balance. This was represented with the smashing entry of 41 boats and travellers having come from Scotland in the North and Rock in the West. We shared a course with the 200's, 700's and 800's with the expert race team getting away 3 races a day for each fleet without a single general recall. Impressive work there! Especially considering that the fleets rarely clashed on the race track. Although, I will note that 800's have a huge wind shadow (as expected) and running 200's seem to have a huge wind shadow while appearing stationary (half expected). With entries now streaming in for the National champs many teams were using this event as a serious warmup and the results were a good indicator of general form and expected performance - despite several encounters with the U flag more later. Saturday's racing took place in 8-10 knots, with the occasional 12 knot gust to get everyone excited that the sea breeze might really kick in. Racing was tight throughout the fleet with 3 different race winners by the end of day 1. A few of the front runners were caught out by the U flag and had a nasty surprise when they came ashore to find their scores erased. The free beer that was handed to you as you tallied off certainly helped to soften the blow; having been one of the transgressors. After the first day's racing it was fleet newcomers Francisco and Teresa Lobato from Queen Mary who sat atop the leader board with what looked like the only consistent set of results in the fleet. They were even top of the table despite a tally penalty for failing to collect their free beer - widely viewed as their biggest mistake of the weekend! Competing strongly for the Duckhams nominations were Mike Sims / Keith Bedborough who moored up on the Windward in Race 1, and class Supremo Sir Maximus Tosetti who became so distracted by the (admittedly very impressive) low-level Spitfire flypast that he started reaching up the beat and lost 5 places. The fleets spent a lovely evening basking in the mid-summer sun, drinking beer and eating curry on the fantastic sailing club balconies - with the added bonus of the Americas cup live on the big screen (depending whether or not you supported Oracle Team USA!) . A mass RS event must be the only way to meet such a vast variety and volume of dinghy sailors in the world. It turns out that the people who sail either the slow or the uncomfortable boats are also great to share a beer with. Sunday dawned without a breath of wind, but the sun was out so I couldn't find anyone who seemed to care. There did seem to be a couple of sore heads around and it was great to see that the fleet are working hard in the bar to maintain the sail hard, party hard reputation (mentioning no names ,ahem, Chipperfield, Vincent….). An hours wait was called to allow the gentle (very gentle) sea breeze to build before the fleet were sent out to the bay. Another 3 races were sailed in wind right on the bottom end of the wind range. Great work by the race team to get these in with such challenging conditions. Again there were 3 different race winners showing just how tight the racing was . Again consistency was hard to come by. And again Francisco and Teresa were never far from the front. They took the honours by a handful of points from a congested pack just behind them. Impressive work for these newcomers to the circuit, with national champions and Olympians occupying the places close behind them. A cold drink in the sun concluded a thoroughly enjoyable weekend, with competitive racing, fantastic weather, great race organisation and great mates. With thanks to Paul & Mark Oakey, the overall results for the Magic Marine Championship Tour and the Rooster Southern Tour (after 4 ad 3 events respectively) are at http://www.rs400.org/index.asp?Fleet=RS400&selection=Results&resultyear=2017 Fantastc turnouts so far this year - let's keep it up!!! The next Southern Tour is at the Lymington Dinghy Regatta on 15/16 July. Entries limited, get your entry in asap. A small but select fleet of RS500s joined the massive multifleet event, and from this small base came perhaps the best photo of the event - see above - and the voyager prize for Eric and Perrine from Club Nautique de Wimereux. Congratulations to fleet winners Peter and Karen Matthews from Lancing with a perfect scoreline of 1,1,1,(1). According to Mark Rushall (June "Yachts and Yachting") Hayling Island Sailing Club is a venue sailors seem to love or hate. Probably loved by HISC members but the strong tides, sand banks, the waiting for the wind to arrive and the long queues getting off the island are aspects just about tolerated by visitors. But, Aristotle famously said after his visit to Hayling Island Sailing Club "The whole is greater than the sum of its parts", and so it is. 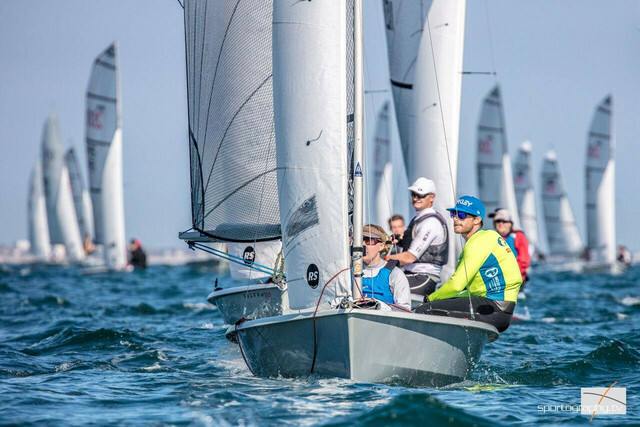 The reason why over 200 boats, more than 300 sailors (across all the RS classes) and probably over 400 people in total came to the 2017 RS Sailing Summer Championships is because an event at HISC is always a memorable one for all the right reasons. The overall race results tell one story: that the event was all but one race short of a white wash for Jerry Wales sailing the first of the new upgraded RS700s to hit the water. He won 5 of the 6 races. A satnav error (or was it early onset Alzheimer's, to be honest I don't remember) told him to head for the leeward gate/finish being used by the RS200s and RS400s on the outer loop while in the lead of race four. That turned out not to be the shortest way to the RS700 finish and dropped to 4th. The blow by blow analysis of the racing tells another story. As forecasted we were blessed with an 8 to 12 knot gently oscillating Southerly wind on Saturday combined with glorious sunshine, conditions to give the lighter and less lighter sailors a chance of success. The key feature of race one was a dominant left shift about a minute after the start. Those who could tack off onto port spent the best part of the first beat being lifted up to the first mark. Those who carried on a little longer on starboard found themselves on a port lay line that had them approaching the mark under a wall of RS400s with their spinnakers up - slow. Wales was one of those who tacked off on the left shift and led 2013 National Champion Robbie Bell and Colin Dacey round the first mark. From then on it paid to ignore the shifts and head hard right. Generally, it paid to overstand the starboard lay line to guarantee a lane clear of the RS400s. With few passing lanes available the top three finished in the order they rounded the first mark. No wind and an hour's postponement on Sunday (it's Hayling!). Will they, won't they? They did (send us out). A crawl out to the race area on the last of the ebbing tide and a further wait for a stable wind. The conditions were to the liking of the blue hulled upgraded RS700 of Jerry Wales who led most of the way round the day's three races (with the exception of the navigation error). The day's top sailor was Stephen Hermanson who showed great class and boat speed to post three second places. The lighter condition clearly to his liking. Not though to Robbie Bell who slipped down the order posting a 5th, 10th and a DNF. Pete Purkiss picked up the race win in the first race of the day (race 4) and a very consistent series elevated him to second overall. All the racing was started under the U flag which meant no individual recalls. In the absence of any general recalls, there were no recall signals on any of the 24 starts (4 classes, 6 races), how weird was that! If you had strayed over in the last minute you were probably blissfully ignorant until you saw the day's results (or read the board on the back of the committee boat). I am not sure which is worse thinking you might be over (and you're not) or having no idea (and you were). Thanks, are also due to Emma McEwen (of RS800 fame) for the hand-crafted event bowl prizes. It's the little things done with love that make such a difference. The highlight for me was actually seeing Martin Wadhams doing something useful (I'd heard it sometimes happened) doing a fantastic job helping us pull our boats across the sand. Proper RS support. 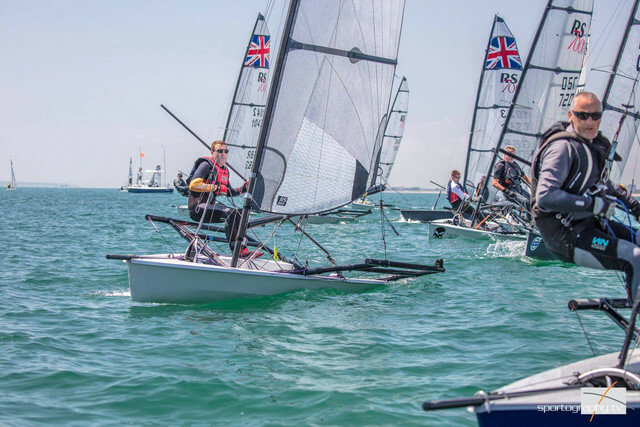 The aptly named RS Summer Championships were held over the weekend of 17-18 June with extra water and sun screen being the order of the day as temperatures rose to 30 degrees . With 200+ boats across the RS classes present it was quite a spectacle and a very busy weekend. On Saturday racing started on time with the wind coming steadily from the south at 7-10kts. As ever Luke and Emma McEwen, the reigning national champions, were hot out of the blocks and established a good lead with Phil Walker and John Mather in hot pursuit, and Andy and Allyson Jefferies showing good pace in lighter conditions than they normally prefer. Race two saw former national champions Tim Saxton and Fiona Hampshire take a bullet from Phil and John with another former national champion Pete Barton and class chairman Chris Feibusch taking third. Fiona must have been wondering what had happened to all the wind having won the Corinthian class and finishing 5th at the recent J70 Europeans, in winds which varied between 25 and 35kts, two weeks earlier. Towards the end of race two the wind started to become a little less stable, initially swinging a bit to the East before moving slightly West of South and falling a couple of knots. Having attempted and just failed a port flyer in race two Ralph and Sophie Singleton repeated the tactic in race three with Phil and John joining them. This time both managed to cross the fleet by 2-3 boat lengths, hit the lay line with tide now having changed direction and round the first mark with a useful lead. Phil and John took the race win with Ralph and Sophie in second and Andy and Allyson leading the starboard starters home in third. The fleet were welcomed ashore by RS Sailing the event sponsors who had laid on some much needed cold beers . Thanks to Alex and his team for organising that! So overnight Phil and John led from Luke and Emma, with 3 boats then tied in third place. RS sailing had also laid on a band and a curry was enjoyed by all. So many questions were still to be answered: Would Luke and Emma finally come of their long winning streak? Would the sea breeze fully develop on Sunday? and how long would it take us to get off the island after the prize giving? The answer to question two was no with wind looking to be barely over the 5 knot minimum required to race and a one hour postponement was required. With this in mind Paul Jenkins and Nick Jerkins decided that the 15 minute option to getting off Hayling was their preferred choice and packed up the boat as Nick was not tempted by another day in the cockpit. Luke and Emma decided that the answer to question one was no as they took a bullet in the first race where either the helm or the crew getting on the trapeze was a "Brucie" bonus. Ralph and Sophie had persisted with their port tack starting option, this time ducking a few boats but then getting some clear air out on the right. However James Hughes and Toby Wincer had been going quickly and left the Singletons with a decision whether to tack in front but clear of them or duck them. They chose the former but did not quite come out of the tack quick enough and took a penalty turn. Despite this they recovered up to second by the end of the race with the Jefferies taking third. The three boats lying in third place overnight were all struggling on day two in the lighter breeze. Race five saw the emergence of Ella and James Moreland who were starting to show some real pace upwind and chased Luke and Emma around the race track to take second with Dan Goodman and Debbie Clark taking a well earned third. As with day one there was a wind shift before race six which finally added some starboard bias to the start line. Ella and James made the most of this but had Ralph and Sophie chasing hard. By this time Ella had perfected her downwind technique and any gains that Ralph and Sophie had made in previous races downwind were negated giving Ella and James the final race win. Third place went to Martin Orton and Ian Brooks who have recently bought Roger Philips' championship winning boat. They were starting to show some good boat speed in the light winds which have not previously been their forte. So overall Luke and Emma managed to keep the pack at bay and take another event win, with Phil and John just managing to hold onto second by a point from the Singletons in third and Ella and James taking fourth. This was a blistering hot weekend with some excellent race management by the race team which managed to complete a series. Thanks to HISC for the great organisation, to RS Sailing for sponsoring the event and to Harken for the prizes. The RS800s move on to Eastbourne SSC in two weeks' time where we will be welcomed with the usual amazing enthusiasm. After that it is Lyme Regis SC in early August but because this is part of their regatta entries may be limited so early entry is advised. Despite taking all the back routes it still took the author one hour to get off the Island but thankfully the A3 was relatively clear. See you all at Eastbourne.